Surely, there is nothing inherently wrong with laughter and having a good time. But when it comes at the expense of Islam, that’s a big problem. I don’t expect kuffar to understand this, especially those kuffar coming from a Western culture that considers anything deemed sacred as a target for ridicule and mockery. Jewish comedians have a long history of lampooning God and their own religion. As Rabbi Molly Kane writes, “Jewish humor loves poking fun at God.” Certain secular whites in the West also have a penchant for crude jokes about all religions, especially Christianity and Islam, as represented by the popularity of publications like Charlie Hebdo and others. Don’t get me wrong. Presenting Muslims and Islam in the best light is part and parcel of doing dawah. The problem is when the primary way of doing this is by violating Islamic principles and misrepresenting Islam itself just to appease non-Muslim sensitivities. The video begins with a presumably Muslim woman quipping about how sticking to her diet routine and abstaining from ice cream is jihad for her. 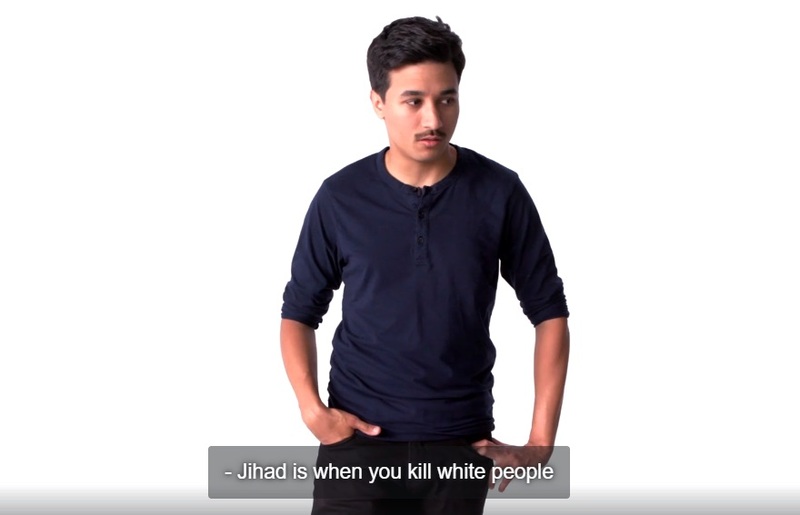 Then there is a hard transition to a presumably Muslim man informing us that jihad means killing white people. This is said with a straight face. Non-Muslims are supposed to catch on to the sarcasm, I guess? Being sarcastic about murdering white people is supposed to be funny, apparently. Eventually, the speakers settle on the idea that jihad means struggle. The logical conclusion that they draw from this is that whenever a Muslim struggles with something, then ipso facto that is jihad. Even when it comes to impermissible crimes like engaging in lesbian relationships even though your Muslim parents don’t approve, that is jihad! Self-described “comedian” Aman Ali extends this point. The sad thing about this attempt at levity is that it’s not even original. 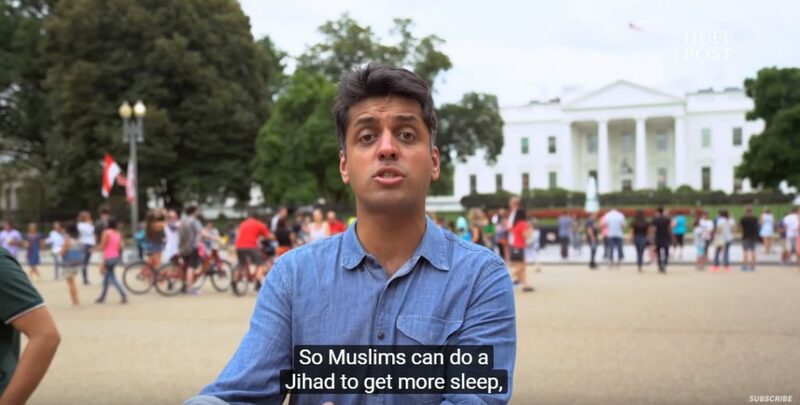 Wajahat Ali made the same exact joke in another cringe-inducing video about Islam two years ago. 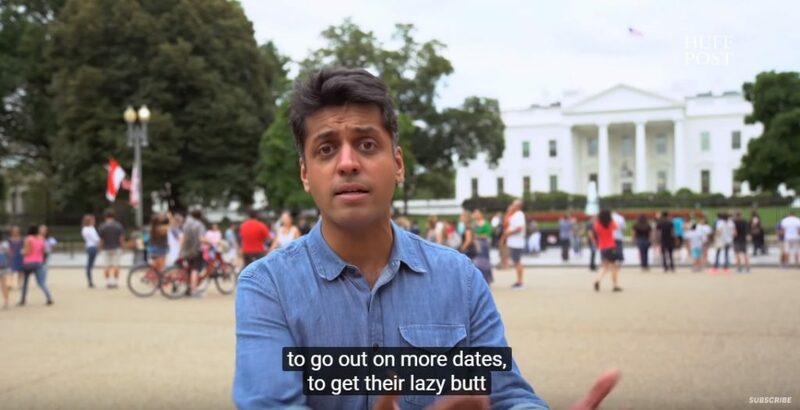 Yes, I’m talking about that Wajahat Ali, the Zionist shill who writes sympathetic portrayals of Israeli settlers and called God an “absentee landowner.” He makes a pointless but awkward appearance in this video as well. Also noteworthy, fellow Zionist shill, Rabia Chaudry, is an adviser on the video, as listed in the end credits. Poor Aman. Imagine being such a sad comedian that you have to steal jokes from a NYT op-ed writer. 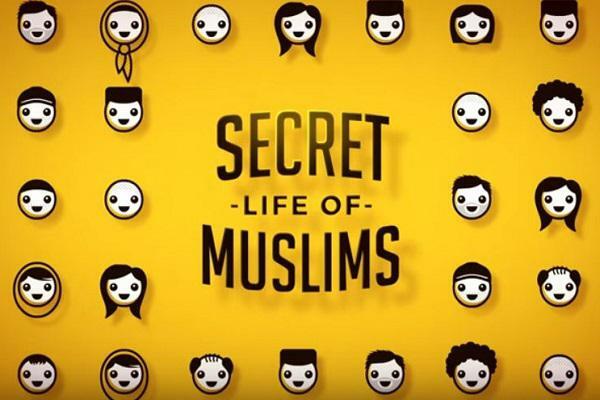 Two of the people featured in the video are self-described “queer Muslims”: Fawzia Mirza and Wazina Zondon. Fawzia Mirza teamed up with the infamous HEART: Women and Girls in 2016 to put on an “LGBT iftar” in Chicago, that sadly was promoted by Mohammed Kaiseruddin, a former chairman of the largest masjid council in Chicago. We see this attempt by activist liberal types trying to gain legitimacy in the Muslim community by attaching themselves to certain figures who are more so in the mainstream for one reason or another. Unfortunately, that dynamic plays out in this video as well, where Imam Suhaib Webb makes a 3-second appearance. 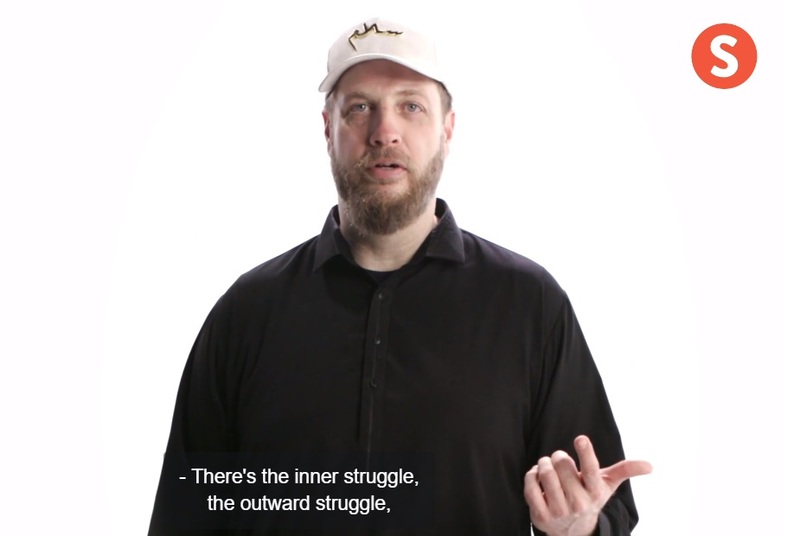 They give Imam Suhaib literally a few seconds in the whole video. Why? It is just a token inclusion to lend legitimacy to lesbians, Zionists, and failed comics who want to educate their SJW friends and allies on how non-threatening they are. The question is, why would Imam Suhaib participate in this travesty? For benefit-of-the-doubt purposes, let’s imagine he didn’t realize this video was going to be the final result and he recorded his portion completely unaware of what else was going to be included. Fine. But now that he has seen the final result, he should demand they exclude his footage. At the very least, he should make a clear statement that he not only does not approve of the content of the video but also that that content violates Islamic principles. As it is now, viewers easily get the impression that Suhaib Webb is on board for this kind of joking about Islam and distorting key tenets of Islam. The main sponsor of the video is the Doris Duke Charitable Foundation. This is a politically liberal organization that promotes multiculturalism. Much like the Proteus Fund, which is explicit in its mission to promote a cultural, LGBT-inclusive, feminist-aligned version of Islam throughout the world, the Doris Duke Foundation also grants large sums of money to Muslim groups who evince this leftist vision. You can see a list of grantees here [filter by “Building Bridges” to see Muslim initiatives like the Pillars Fund, ISPU, El-Hibri, etc.]. Another sponsor of the video is the El-Hibri Foundation. Much could be written about El-Hibri and their naked attempts at promoting an Islam that is at home with mainstream left-wing democrats and the most depraved social justice activists. For example, this past year, El-Hibri has given their “Community Builder Award” to Nadiah Mohajir, the co-founder and executive director of HEART: Women and Girls. Enough said. We need to recognize these well-funded attempts to liberalize the Muslim community and bring Western Muslims into conformity with left-wing doctrine. I am not an advocate for the right wing. Let me repeat: I am NOT a right-wing advocate. I am not saying Muslims should support republicans, etc. My message is simple: Muslims should first and foremost be committed to Islamic values and a vision of politics that is based on Islam. Insofar as both the political left and the right have positions that are contrary to Islam, that is the extent to which we ought to disassociate and, at times, denounce those political parties. It’s not that complicated. A person may say a word that is pleasing to Allah, not paying it any heed, for which Allah will raise him several degrees in status, and a person may say a word that is displeasing to Allah, not paying it any heed, for which he will fall into Hell. Jihad is doing effort towards any direction, you’re sawing the torso of your parents? 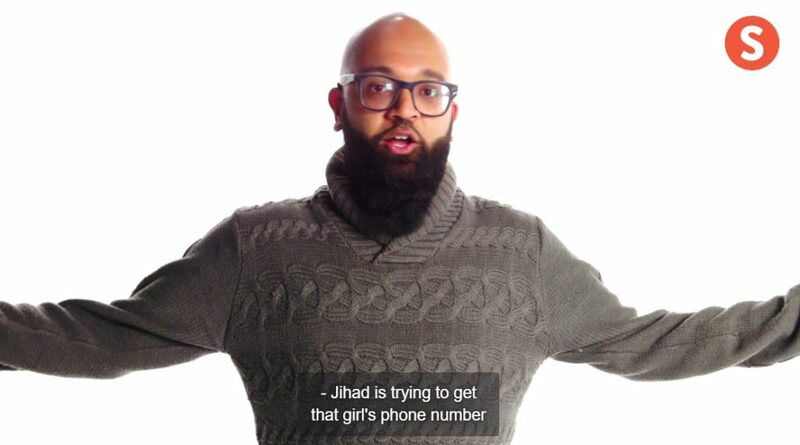 That’s jihad. HAHA I made a joke HAHA. At least try to be funny, they have 0 talent. Seriously, this people sicken me. And why this modern fixation about LGBT community, it is stated quite clearly in Quran and sunnah that you MUST stay away from them. Do they know nothing about bid’ah? That’s a pretty serious crime right there, tattoos, being half-naked, showing the hair, telling disgusting things about Islam, this video is wrong on so many levels. The concept of sacred is absent from American society. It is a cultural disease. Its amazing that we have come to a time where alt/right wing nationalists/white supremacists are posting about hadiths on Islam to combat the left ideologies being forcefully injected into Islam.